Backed by years of experience in this domain, we have been able to offer the finest collection of Brick Bat Coba Waterproofing Service. These services are famous for low cost and client focus approach. Apart from this, these services are available at very effective prices and within the requested period of time. Providing and laying integral cement based brickbat waterproofing treatment including preparation of surface as required for treatment of roofs waterproofing, balconies waterproofing, terrace waterproofing etc. brickbat Waterproofing Coba by exposing the RCC slab to its bare surface Clearing the surface of all Lose particles and dust, Carting away of debris and spreading neat cement slurry mixed with waterproofing compound on the cleaned surface, filling up the uneven surface, honeycombing etc. Spreading of CM(1:5) mix, mixed with waterproofing compound and grouting brickbat in the mortar with a necessary slope of approx. 1 in 100 for easy flow of water. Filling the joints in the bricks with the mortar properly. This treatment to continue along the inner side of the parapet or other adjoining walls up to a height of 30cm in the shape of a round Vatta and finally converting the top surface with joint less waterproofing cement sand mortar 1:4, 20 to 25mm thick finished smooth with trowel in cement colour marked into 30cms * 30cms false squares. The average thickness of complete treatment shall be 100mm. Curing to be continuously done for the surface. Ashok Water Proofing is one of the leading names amongst the service providers of Waterproofing Service in Mumbai, Maharashtra. We have successfully made a mark amongst the best service providers for waterproofing all over India. Some of the widely appreciated services that we offer include services provided for Roofing Singles waterproofing Services, Mangalore Tiles Waterproofing and Membrane Sheet Waterproofing. 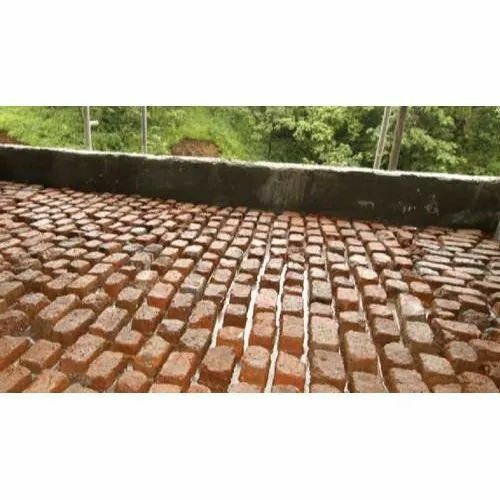 Roof waterproofing, App memmbrane sheet, brick bat coba waterproofing,I.P.S waterproofing treatment,chemical coating waterproofing, tarfelt sheet waterproofing,lequid membrane,civil woraks like( plaster,interior & exterior painting,polymer plaster,floor tiles fitting,wall tiles fitting,etc.) bunglow roof waterproofing, terrace waterproofing, roofing sheets fitting like A.C sheet,G.I sheet,precoated sheet etc. specialist for waterproofing and civil contractor The company has been operational since 2000 till date from Mumbai, Maharashtra. and Civil Construction Services. Our company has grown and expanded every day, taking every project to be a new challenge. With a workforce of about 20-30 employees, Ashok Water Proofing has always believed in providing utmost satisfaction to its customers.